At Profit Point, our consulting team has over a century of combined experience implementing Aspen Supply Chain Management (MIMI) solutions. Although the concepts for developing a model are similar from plant to plant, there is nothing quite like getting boots on the ground to truly understand the client needs. With that philosophy in mind, a colleague and I just returned from a scoping trip to a client in Tarragona, Spain. The client is a major global chemical producer who requested a proposal to build a scheduling and optimization model using Aspen SCM. During the scoping visit, we started with a tour of the facility. Diagrams and charts are always good for reference but there is nothing like actually seeing the equipment to truly understand it and how it interacts. 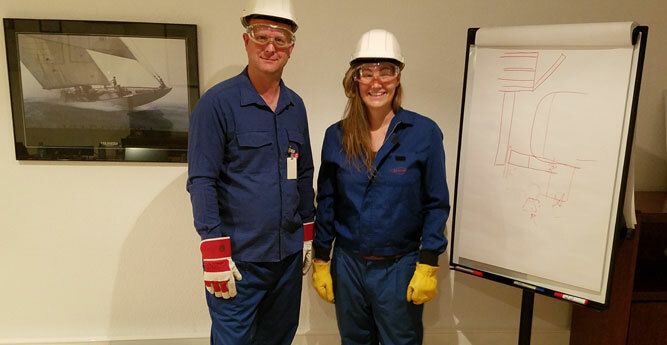 The plant tour also provided us the opportunity to wear the stylish outfits in the picture above. Once the plant tour was completed, we met with the schedulers to dive deeper into their production processes. During these meetings we discussed the various pieces of equipment, their routings, special considerations, transitions, cleaning considerations, batch sizes, etc. as we tried to extract all the details the scheduler uses on a daily basis to plan their production. We also met with the team members responsible for their ERP data. This allowed us to connect what the scheduler told us as to how he schedules with how the data is configured in the supporting ERP system. During this discovery we were able to identify any potential changes needed to the ERP data. After returning to the US from our meetings, my colleague and I met to discuss everything we heard from the client. We consolidated this information. We also had several follow-up meetings to ensure our understanding was correct. Although this process may seem extensive as many models are similar, we have found that there are always differences and the time and effort invested in this up front discovery leads to a higher quality delivered product for the client. Now on to the real fun…..implementing then going live with a new scheduling tool for the plant! If you would like to learn more about our Production Planning and Scheduling services, please contact us.